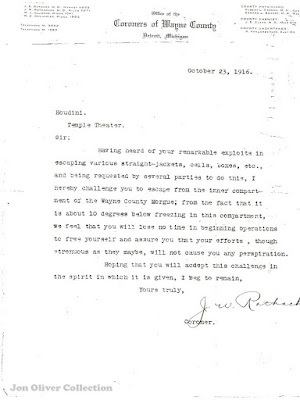 Jon Oliver has sent over a copy of a curious Houdini challenge letter from the Wayne Country Morgue in Detroit dated October 23, 1916. In it, coroner J.W. Ratbach (sp?) challenges Houdini to escape from their cold storage vault. It's unclear if Houdini accepted, but as he once turned down a challenge to escape from a coffin casing as being "too gruesome," he may have taken a pass on this one as well. 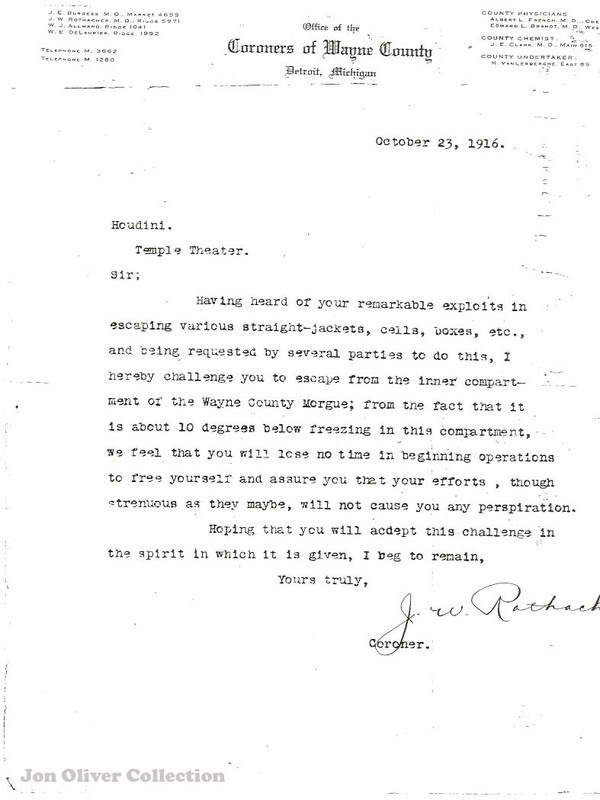 The tone of this letter is a little playful ("your efforts, though strenuous as they maybe, will not cause you any perspiration"), so maybe this challenge wasn't completely serious. However, the letter is somewhat chilling to read today. That's because exactly 10 years to the day after it was written, Houdini would travel by overnight train to Detroit and give his last performance at the Garrick Theater. Six days later, he would be dead. But according to Jon, Houdini once again avoided confinement at the Wayne Country Morgue (this time for real). His body was taken direct from Grace Hospital to the Wm. R. Hamilton's Funeral Home just a few blocks away to be readied for transport back to New York. Still, a macabre Houdini memento to be sure. Great letter. It's sounds like it was written in jest, but who knows. HH must've gotten challenges from all sorts of odd places. This escape would make for a great episode of Houdini & Doyle. It does sound a bit in jest. I doubt HH accepted this challenge. In all probability, he gave Mr. Ratbach...the...cold shoulder.